The institutions of modern society, including governments, large economic structures, and military forces, are organized in bureaucratic fashion. A bureaucracy is a form of organization that operates by means of a wide range of closely supervised departments capable of performing specific tasks in efficient ways. This division of labor, or specialization, is carried on according to well-defined rules and regulations. Therefore, the workers in a bureaucracy (i.e., the bureaucrats) perform their tasks within a compartmentalized environment that narrows their focus to the task at hand. Potentially mitigating circumstances that might call into question the task set for the worker, or the rules governing its implementation, are almost always ignored. "The principles of ... graded authority mean a firmly ordered system of superiority and subordination in which there is a supervision of the lower offices by the higher offices. ... Rational calculation ... reduces every worker to a cog in this bureaucratic machine and, seeing himself in this light, he will merely ask how to transform himself into a somewhat bigger cog. ... [Such an institution's] specific nature ... develops the more perfectly the more bureaucracy is dehumanized." Out of this emerges a "bureaucratic mindset." The bureaucrat is supposed to think of his or her assigned task and how best to accomplish it. That is what is meant by "staying with the program." The bureaucrat is not supposed to think why the task has been assigned or what its implementation might broadly mean. Like the task itself, thinking too becomes detached from any context but that generated by the bureaucracy. This attitude is reinforced by the fact that responsibility is also compartmentalized. As long as one pursues the task efficiently, according to prescribed procedure, one is acting responsibly. Through this approach, it becomes difficult to hold any particular bureaucrat responsible for the overall impact of a policy. The task of implementation is too fragmented. No institution is a better fit for the bureaucratic structure than the military. It is a model for Weber's "firmly ordered system of superiority and subordination in which there is a supervision of the lower offices by the higher offices." Work goes on within a compartmentalized environment structured by rank and myriad rules and regulations. Action is focused on fulfilling specific orders normally without reference to outside consequences. As a result, within the military bureaucracy thinking must always be within the box, which means it is done within the institution's set thought-collective. Indeed, given the military's particular environment, one that strives to shape the thought as well as the action of its participants, thinking can take on near totalitarian constraints. The following scenario reflects this reality. Imagine a room in which two privates sit discussing some mission-related issue. Between them there is an equality of rank and so the discussion can be relatively candid. In walks a sergeant, who joins the discussion. The sergeant's opinion can immediately supersede those of the privates and end the discussion. We can repeat the scenario using two sergeants joined by a lieutenant or two lieutenants joined by a captain, and so on up the line. It is rank that carries the power to decide mission-related issues and not necessarily knowledge or even experience. And, once the decision is made, the senior officer's version of reality cannot be challenged except by someone of superior rank. His or her orders must be obeyed even if a subordinate can reasonably predict disaster as a result. Thinking outside the box, and then acting on the resulting unauthorized thoughts, opinions, and conclusions, is the bureaucracy's equivalent of criminal behavior. At first it seems surprising just how few people in the military challenge its thought-collective. Today there are about two-and-a-half-million individuals in the U.S. military (including the reserves), and the number incarcerated in military prisons with a sentence of one year or longer is (using 2007 numbers) 1,089. Relative to the incarceration rate in the U.S. civilian society this is remarkably small. The percentage of this number that represents the willful disobeying of orders (rather than the usual criminal acts such as assault or theft) is smaller still. While at first this might seem surprising, it is not on second thought. The military is not a democracy. It is the closest thing we have to a successful version of George Orwell's 1984. The restrictive thought-collective is reinforced not only by a rigid hierarchical culture of obedience but also by carefully cultivated peer pressure. Someone who breaks out of this "box" and does so for reasons of conscience is a rare individual indeed. "Bradley Manning was an army intelligence analyst with U.S. forces in the Middle East who became deeply disturbed by what his job revealed to him. Essentially, it made him a front-row witness to what he described as 'incredible things, awful things.' This primarily entailed the careless killing of innocent civilians. As an act of conscience he gave to the website WikiLeaks over 200,000 classified documents as well as a graphic video showing an attack on Iraqi civilians." "I hoped that the public would be as alarmed as me about the conduct of the aerial weapons team crew members [this refers to a particularly egregious army helicopter attack on civilians recorded on video tape and leaked to WikiLeaks]. I wanted the American public to know that not everyone in Iraq and Afghanistan are targets that needed to be neutralized, but rather people who were struggling to live in a pressure cooker environment of what we call asymmetric warfare. After the release I was encouraged by the response in the media and general public." However, the U.S. military has shown no serious concern about what its soldiers have done, and continue to do, to civilians in the Middle East. This is because those soldiers have acted in ways compatible with the bureaucratic rules of the organization they serve. Under these conditions the killing of civilians, no matter at what frequency or number, is deemed accidental as long as the soldier follows the military's self-prescribed "rules of engagement." Having done so, civilian casualties become "collateral damage." Therefore, no one is culpable. It is, of course, possible to force the military to change its behavior by making "collateral damage" so distasteful to the U.S. public that it becomes a political problem that civilian leaders must address. That is exactly what Bradley Manning was trying to do. 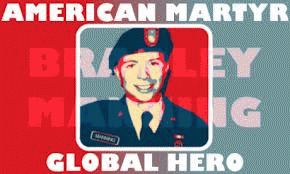 That is why the military has shown dramatic concern over what Bradley Manning has done. He has gone outside the box. He has broken free of and actually publicly challenged the military's thought-collective. Since the VietNam War the U.S. military has eschewed the draft and embedded journalists, so as to minimize public awareness of battlefield realities. They are not now going to let one private with a conscience bring public revulsion down on their heads. So, they have accused him of "aiding the enemy" and hope to send him to jail for the rest of his life. They hope this will be a lesson that prevents others from following in Manning's footsteps.